Posted September 22, 2017 by Diane & filed under My Books. Getting a blurb is a big deal for a debut author. It’s an early validation of your book and your talents, and it’s one of the high points in the months before the publication date. When a debut author received blurbs from established authors she admires (or adores, or worships), the resulting emotions are immense. I’ve been holding off on announcing my blurbs, which made me beam all day. These have now appeared in my advanced reading copies (the ARC, which is an uncorrected version of the book shared with reviewers and readers before the publication date). My wonderful editor suggested I add them to my website, so they are now on the Books page, but I wanted to share them here, too. 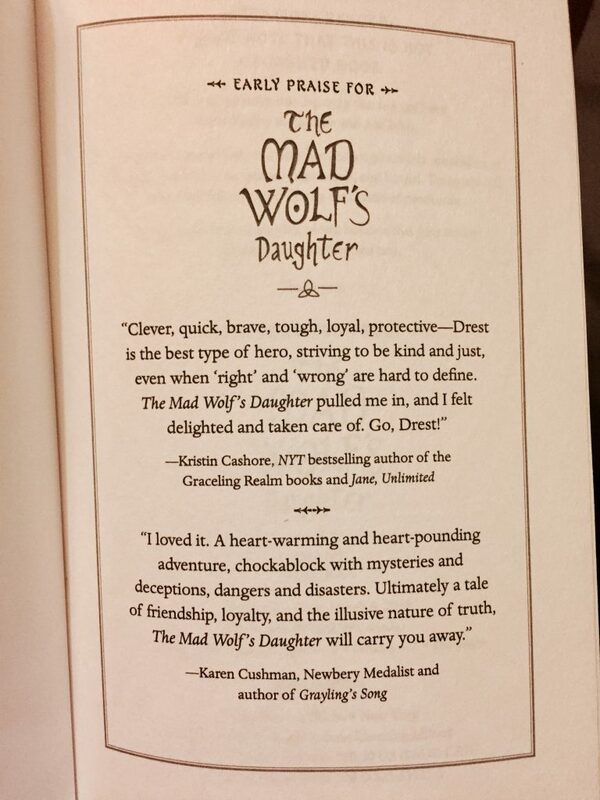 Thank you Kristin Cashore and Karen Cushman for reading my debut novel and sharing such kind words about it. Posted August 26, 2017 by Diane & filed under Book Recommendations. A genius inventor, loyal robots, and a deadly search for the most fantastic creation of all draws two children into tragedy and flight tragedy in this fast-paced Victorian steampunk adventure. Lily Hartman lives in a world of mechs—thinking, feeling humanoid (or animal) machines—with the mechanical fox Malkin, a wise-cracking pet, as her most trusted companion. 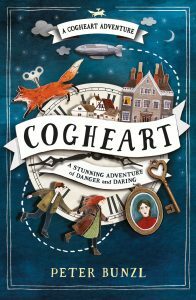 Malkin witnessed the disappearance of her inventor father in an airship crash, and soon thereafter, Lily finds herself in the middle of a search for her father’s secret masterpiece: the perpetual motion machine. With murderous thugs and a greedy housekeeper willing to destroy anyone or anything for this machine, Lily flees, inadvertently drawing Robert, a clockmaker’s son, into her desperate bid to survive. Not all is what it seems (very little is what it seems, in fact), and soon Lily finds herself in mortal danger for an invention she carries much closer than anyone but her father ever knew. Courage, loss, sacrifice, and resilience are key themes of this swift-paced tale, topped with a nail-biting climax in Big Ben’s clock tower. Enjoy each mech’s distinct personality, hold your breath through the action of the story, and bask in the peace found by the characters at the end. A worthy read. In the first chapter of this powerful novel of magic and loss, Sister Witch’s twin sons, Ned and Tam, are parted when Tam dies in their attempt to sail. 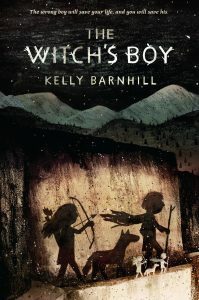 Sister Witch, a crucial but under-appreciated member of her village, secures Ned’s life through magic—a dangerous resource that seems to have a complex life and personality of its own. It’s an act that leaves Ned with a stammer and his brother’s voice lingering in his head. Sister Witch’s magic is dangerous, but contains unmistakable power. A stranger to the town sees it, and wants it for himself. This is the Bandit King, who has had a taste of magic and knows what it can do. He tries to steal it when Sister Witch is gone, and Ned takes the magic onto himself. This is no gentle, obedient, fairytale magic: it’s painful in every sense. This magic sears into Ned’s flesh, skittering a web of words over him. Now it’s not just Tam’s voice in his mind, but the magic’s multiple voices: taunting, teasing, and commanding Ned, even as he begs it to desist. Pursued by the Bandit King, Ned ends up deep in the woods and outside the Bandit King’s own home—and in the longbow sights of the Bandit King’s daughter Àine. A resourceful girl haunted by her mother’s death and fearful of what her father will become if he gains the magic he so deeply desires, Àine knows she must keep Ned and his magic away from the Bandit King. Ned and Àine escape the bandits sent by her father within a forest of changing paths to a collection of ancient stones where the magic is more powerful than ever, and to a final choice of self or sacrifice. 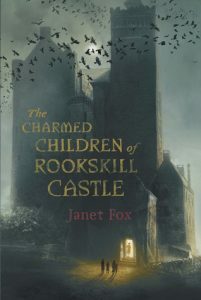 Read this if you like your fairy tales dark, your characters conflicted, your plots tense, and your prose rich and precise. A powerful story. It’s WWII, and Londoners Kat Bateson and her siblings Robbie and Amelie travel to a boarding school in a creepy Scottish castle to flee from the Blitz. You’d expect to find ghosts at Rookskill Castle with its maze of rooms and hallways that seem to disappear, but there’s more: grinding and screeches sound from a secret room, and sounds of a radio. This seems clear evidence of a German spy. But something much darker is at foot: a being that seeks all children in the castle and will take their lives and souls for a purpose unknown. The children at the school disappear one by one. Kat’s quick thinking protects her, but so does a secret she carries: her great-aunt’s chatelaine, a silver ring of charms on chains—a pen, scissors, and a thimble—that may be the way to defeat the powerful creature that seeks her life. The Lad and I loved the fast pace, haunting atmosphere, and splendid writing of this book—but also the narrative sections from the villain’s perspective, which help the reader understand, if not wholly side with, the tormented Leonore. These fun, thoughtful middle grade novels from the not-so-distant past would be fabulous gifts to ring in the new school year for any student. Posted August 24, 2017 by Diane & filed under My Books. Part of the home library I began as a young teenager. I was more careful with some of these bindings than others! When I was 14 years old, I began writing seriously. 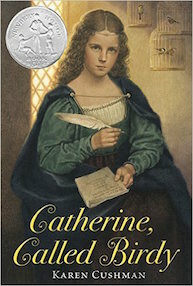 I loved to read and write and knew that I wanted to be a novelist. My parents took that dream seriously. While I was always free to read anything I wanted, they suggested that I also read the classics. I don’t think they planned for me to learn Great Themes of Life and Literature—that wasn’t quite how they thought—but they’d read somewhere that to know how to write, you needed to read the important books of the past. To encourage me, they offered to buy me any classic I wanted from our local bookstore and start my own serious home library. 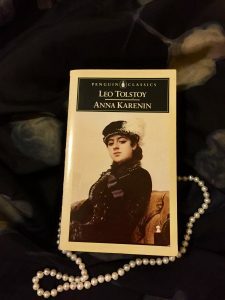 This was my first taste of Tolstoy and my favorite novel. I knew two things: that I had clear tastes in literature (I had always loved Susan B. Cooper’s The Dark is Rising series and was getting into Anne McCaffrey’s Dragonriders of Pern), and that we didn’t have a lot of money. So I was careful with what books I picked, looking for engaging descriptions and a price as close to $5.99 as possible. 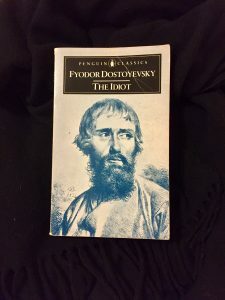 Penguin Classics paperbacks helped me start my personal library (hence the theme of the first picture of this post). And my local bookstore carried a generous selection of them. To foster my loyalty to those slick black-and-beige volumes, many included a list of “Other Books You Might Enjoy” in the back, sharing “new” classics that, indeed, I did enjoy. Read the classics. Read texts that span cultures, countries, and histories. That’s a good place for a writer to start. 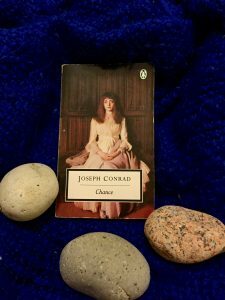 I never could decide if Conrad was a feminist or not, but I loved the mystery at the heart of this novel. I’m glad my parents gave me that advice and encouraged me to build the foundation of my own home library in this way. And not for any lofty reason, but simply this: I loved classics. I thrived on those complex sentences with layers of meaning; those characters who suffered to the bottom of their souls (and questioned if they had souls in the first place, if love could be pure, if they had any chance standing up against the grinding wheel of Fate); and those incredible stories (talk about conflict and stakes). I knew these authors well before my high school began teaching them, and had my favorites: Thomas Hardy, Joseph Conrad, Leo Tolstoy, Fyodor Dostoevsky, and Emile Zola (notice a trend of drama, gloom, angst, and bleakness?— that was candy for adolescent me). I didn’t understand everything I read, but I read (including the forewords and afterwords), kept special notebooks for my quotes and reactions, and reread voraciously. It certainly did affect my writing. 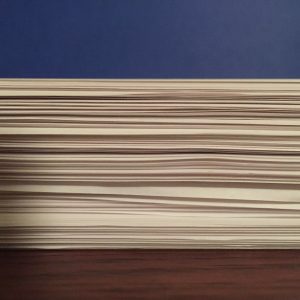 I wrote fiction throughout my teenage years, trying out Big Themes and archetypal characters. I experimented with grim stories, staggering drama, and—yes—overblown prose. I loved books like this. Insanity! Desire! Hatred! Despair! Repeat. In my post-teen years, I broadened my definition of “classic” to reach farther across the world and into non-European pasts, but I’m grateful to those great European novels I began with: They built the foundation of my writing. In my 20s, you could read it not just in my fiction but in my letters to family, my email messages, and occasionally my verbal conversations. No doubt it crops up in what I’m writing today. After I signed my contract for The Mad Wolf’s Daughter, I happened to notice the line of penguin-adorned foam green spines on one of my bookshelves. I began to muse about my reliance on Penguin Classics in my formative home library, and how apt it is that my beloved debut novel is with Kathy Dawson Books, which is part of the glorious world of Penguin. Thank you Penguin, and especially Sir Allen Lane, who founded Penguin Books and began those distinctive paperbacks in a bid to get good books out to the masses. Posted August 20, 2017 by Diane & filed under Book Recommendations. An orphaned serf disguised as a boy rides with a fierce warlord and his men. The Romans left Britain a generation ago, but the island still faces rapid changes. Legends are rich and stories make history. So learns the girl as she watches the rise of one of the greatest stories of all: that of Arthur. 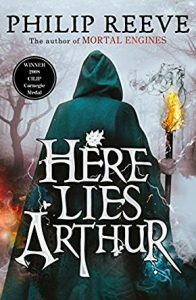 Here Lies Arthur by Philip Reeve is not medieval, but it’s a precursor to the world I write about (and it’s a book that always inspires me). In this magnificent novel, we see who the real Arthur (not a king in this retelling) might have been—a sixth century brutal warlord who pillages holdings and towns to forcefully take his kingdom. It’s also a profound narrative about the power of stories. Told by Gwyna, a young girl we meet as she flees the fire and blood of Arthur’s attack on her lord’s holding. The wily bard Myrddin discovers her “cold as a ghost, wet as a drowned dog…trying to hug some warmth back into my juddering, shuddering limbs,” and rescues her. He asks her to play a role in the legend he’s building around his master Arthur, and after that successful outing with a sword in a pond, Gwyna becomes Myrddin’s servant—and, with the appropriate clothes and a haircut, a boy named Gwyn. With Gwyna/Gywn, we see Arthur from the ground: his bullying, invasions, battles, and manipulation. It’s all to secure his place in the present, and in history; in this world, the stories that are told of you are more important than any of your actual deeds. The landscape of this novel is bleak but beautiful in subtle ways, and always feels real; Reeve’s historical research is stellar. Expect gentle humor as well as grim survival in this powerful retelling of a legend. Here Lies Arthur won the Carnegie Medal in 2008. Posted August 13, 2017 by Diane & filed under On Scotland. Medieval castles dominate Scotland’s landscape, and they’re practical structures for their times. Most start off as giant stone boxes with incredibly thick walls (sometimes square, sometimes rounded, depending on when they were built), copious trimmings to help with defense (say it with me: “crenelated battlements!”), and all sorts of openings with murderous purposes. Many also have gatehouses (which can stand up to battering rams and also provided defenders with a platform from which they could dump truly awful things on the people below), towers (for prisons or pleasure), and, of course, curtain walls to hold everything in. From the outside, even a ruined castle can look pretty fierce. I’m a bit obsessed with the entrances to these forbidding buildings. While I certainly photograph the whole exterior, I also take pictures of gatehouses, doorways, or whatever the entry is; I like to imagine what my characters would feel when they’re just about to walk in. Here’s a wee tour of a few of my Scottish favorites and their most impressive features. We’ll start with Caerlaverock Castle. This Dumfries beauty, first built in 1270 by the order of Sir John de Maccuswell (the family known as the Maxwells), boasts a formidable gatehouse with its right tower from the 13th century and its left tower and actual entry from the 15th. 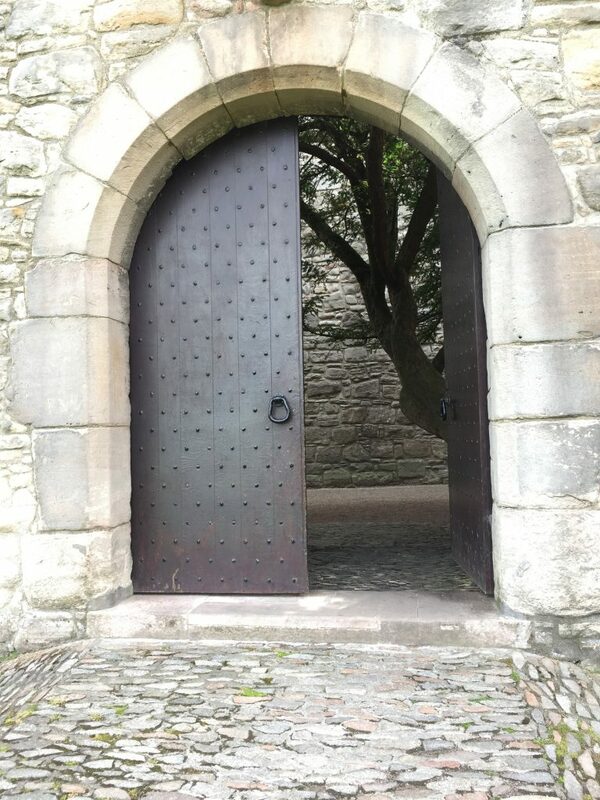 The door itself is a nice example of a two-centered arch, a type of doorway that was very popular in castles in the early- to mid-medieval period. 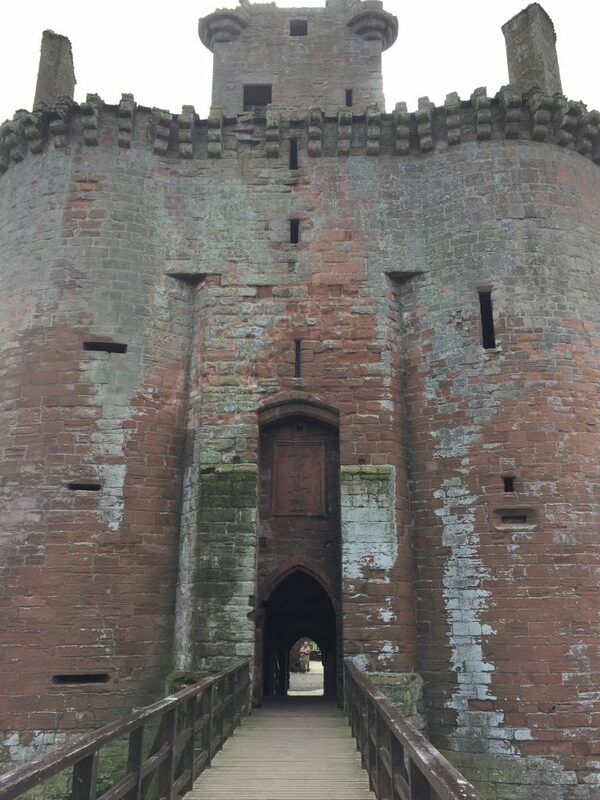 As you approach Caerlaverock, the front of the castle seems to bellow its power through its mighty presence. And it had to: this castle was on a prime spot in the border between Scotland and England. In 1300 during the Wars of Independence, the English king Edward I brought an army of over 3,000 men to siege Caerlaverock. Despite the significant defense of its entry and moat, the castle, with a garrison of only 60 men, surrendered in two days. Edinburgh’s Craigmillar Castle didn’t need to worry about sieges too much, though it has a massive curtain wall. For show? Because any self-respecting castle would have one? Just in case? First built by Sir Simon Preston (or his son, also named Simon) in the 14th century, this was a well-fortified home. And it stayed in the family for a long time. Sir Simon Preston IV was a keen supporter of Mary Queen of Scots, and Craigmillar served as a peaceful refuge for her during a particularly troubled time in her life (though it was also the place where the Queen’s advisors developed a plan to end her unpopular marriage to Lord Darnley by murdering him). Okay, so there’s the gossip. Let’s just focus on its beautiful entryway, a semi-circular arch, built in the late 15th century. Past the timber doors, you see a cedar tree, one of two that dominates the inner courtyard. Defense was important, but comfort was, too, and this doorway shows that clearly. A vast collection of shells now marks the entrance, just out of sight of this picture on the left. I wondered if that’s always been the case, and, if so, if their crunch provided a sort of doorbell or warning. Because defense was so important at Blackness Castle, a yett would have been part of the entry. 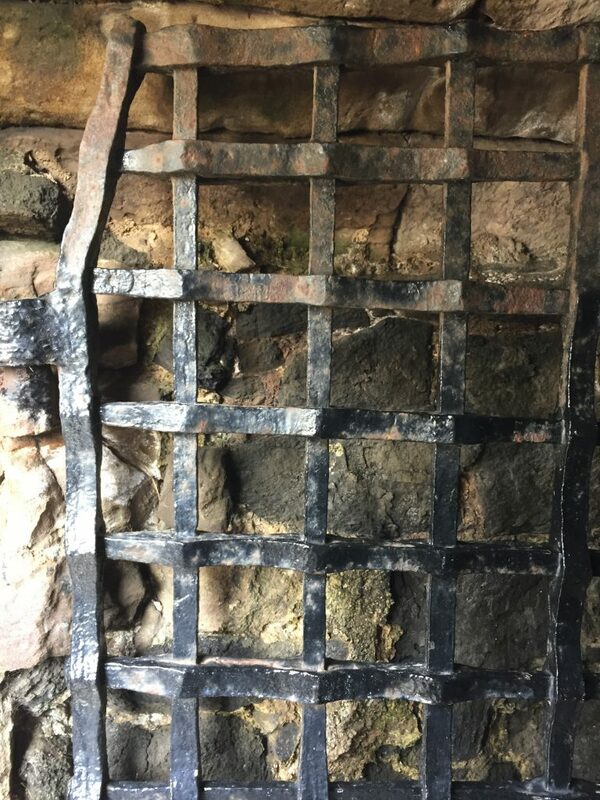 An iron gate of woven strips, a yett would have been very difficult for an invader to take down. It also gave defenders enough room between the iron weave to fire back. Note the design: two horizontal strips are melded onto the vertical strips, a pattern that repeats throughout the yett. Dirleton Castle, a grand East Lothian residence, has a dramatic façade. A fixed bridge now stands where the drawbridge once was, and the gatehouse has many layers you must walk past before you reach the courtyard. Dirleton was built in the 13th century for Sir John de Vaux as a fortified residence more than a fortress, and that fine: there was peace between Scotland and England, and he had nothing to worry about. 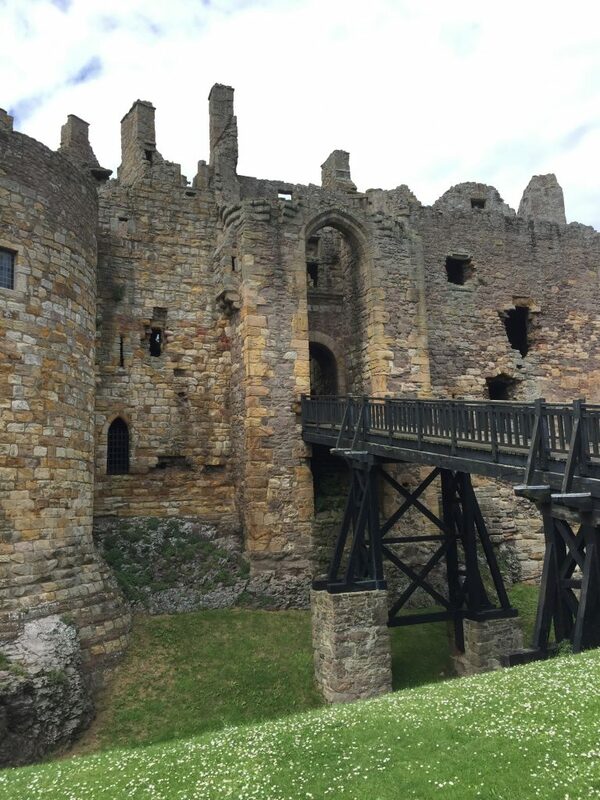 But it was a good thing he’d built Dirleton as a castle; peace ended when the English king Edward I decided to invade Scotland and, in 1298, sent Bishop Bek of Durham (yes, bishops led armies back then) to capture Dirleton. Bek succeeded, though the Scots won it back at some point around 1306—and gave it a powerful gatehouse. You have to imagine its barriers these days, but they were formidable: a combination of portcullis, wooden doors, and yetts. This was one of the strategic castles that the Scottish warrior king Robert the Bruce destroyed rather than risk its falling into English hands again. 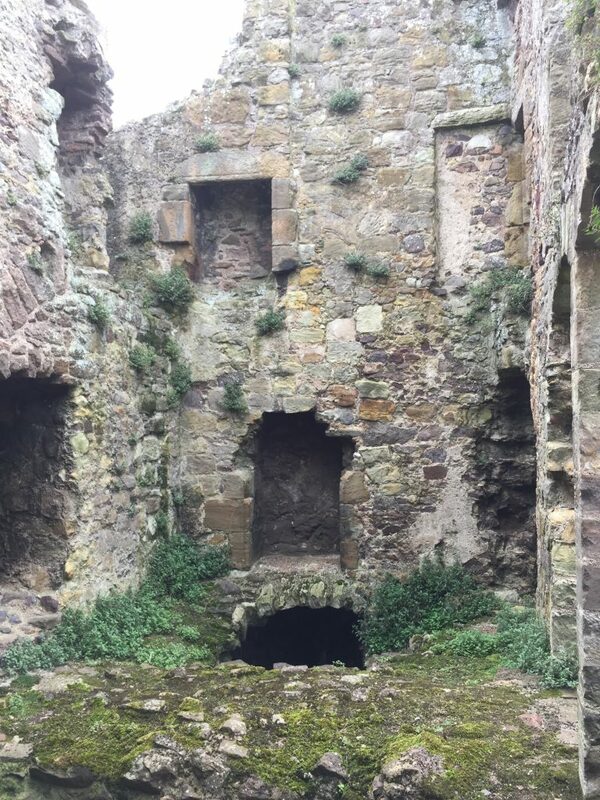 One defense that you wouldn’t see upon entering Dirleton is this small chamber above the gatehouse passage. Here lurks a murder hole, called that because such openings were extremely useful for defenders to use in pouring dangerous substances (or throwing rocks) on invaders. Think for a moment of what a rush of burning hot sand could do to a knight: it would trickle into his armor’s chinks, through his chain mail, past his padded tunic, and against his skin…). 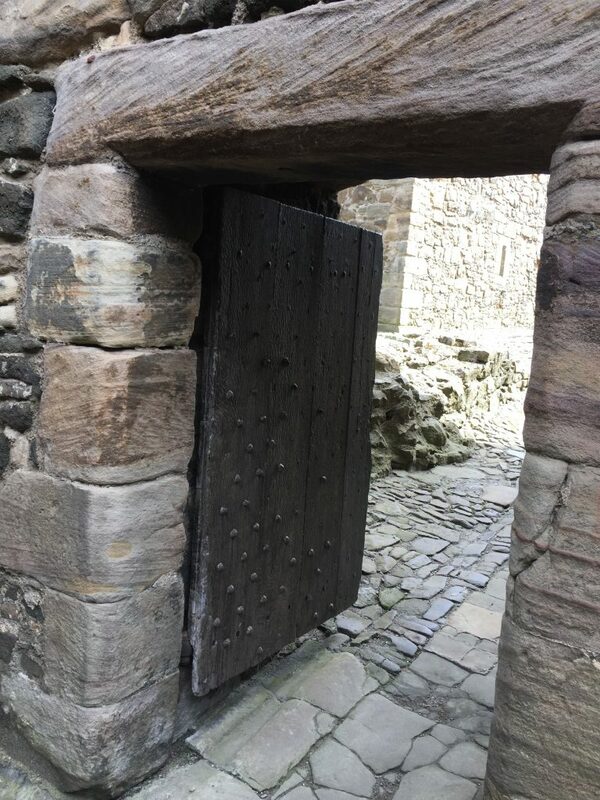 A castle’s exterior is the first glance that you get of these behemoths of defense, but the door itself tells much of a castle’s intent: if it was meant to rebuff, or welcome, or perhaps just intimidate. A castle’s entry shows what a castle is all about. And, thanks to Scottish preservation organizations, we’re able to go through so many of them in Scotland today. Posted August 8, 2017 by Diane & filed under Book Recommendations. 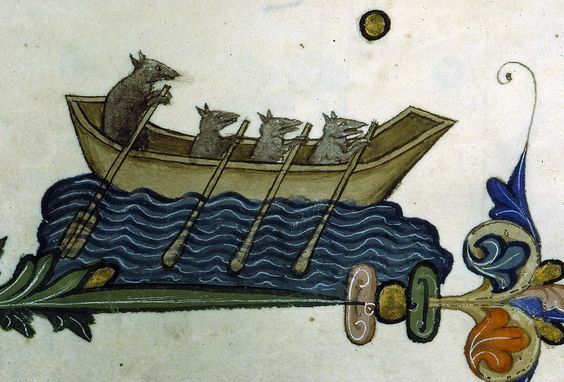 On with the next medieval book! 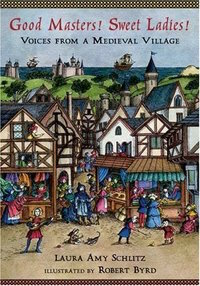 In this engaging, fascinating volume, Laura Amy Schlitz creates a snapshot of a medieval life through its children with help from Robert Byrd’s detailed illustrations. A blacksmith’s daughter muses sadly over her distance from a young nobleman who comes to have his horse’s shoe repaired. Hostility arises between a Christian girl and a Jewish boy when they meet at a river, until they begin skipping stones together and realize that they are far more alike than different. An impoverished villein’s daughter (a villein is a medieval serf) watches her widowed mother humbly outsmart the lord that has come to take their much-needed cow, a price they must pay upon her father’s death. The glassblower’s two daughters soliloquize about a likely marriage between one of them and their father’s apprentice, but with very different perspectives. In this collection of monologues (and two dialogues), the young characters are vivid and lifelike, and the history is accurate and interesting. The children’s stories, as well as details of their lives—of farming, blacksmithing, poverty, and more—make this short poetic volume a rich one. Posted August 1, 2017 by Diane & filed under On Scotland. If you follow me on Twitter, you may have noticed my love for—oh, let’s just be honest—enormous obsession with Scotland’s castles. Edinburgh Castle and its curtain wall looming (as all good castles should) over its city upon Castle Rock. These are the stone behemoths that dominate Scotland’s landscape (particularly in the Borders), looming above cities, countrysides, and seas. 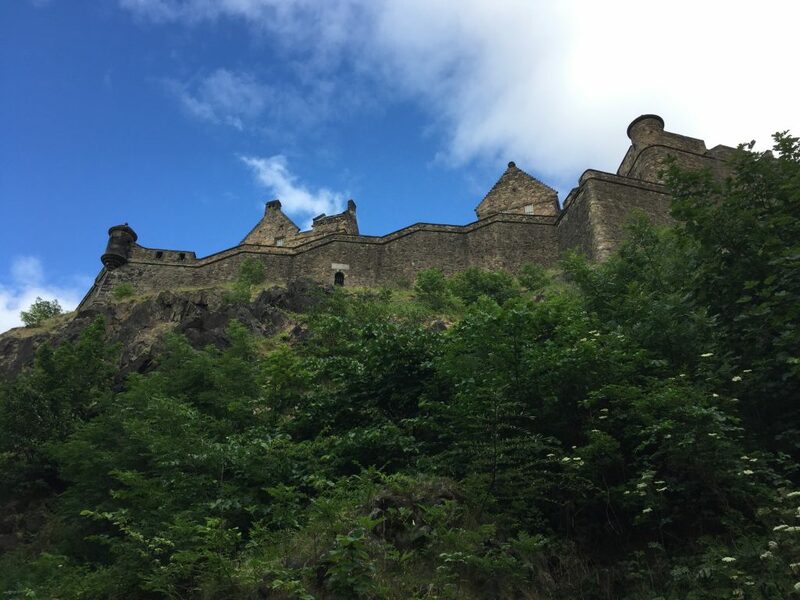 Kings, earls, and lords—Scottish and English alike—built these fortresses from the 11th to 16th centuries to defend, intimidate, and rule the country. And though most of Scotland’s castles are in various stages of ruin, or have been rebuilt well beyond their original master masons’ plans, they’re impressive. One of the most impressive is one of the most famous: Edinburgh Castle. Established as a fortified residence in the Bronze Age and built up into a powerful castle in the early 12th century, Edinburgh Castle stands as a centerpiece in Scotland’s capital and the country’s history. The gatehouse at Edinburgh Castle is one of the most iconic (and photographed) parts of this beauty. Edinburgh Castle’s lurid past includes a history of successful sieges, despite its strong defensive structure (and don’t forget, in later years, the cannons), but also a few wonderfully dramatic retrievals. 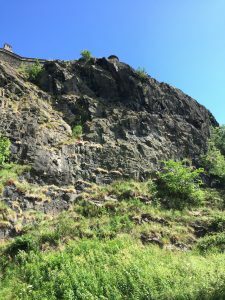 My favorite of retaking harks back to 1314, when a brave Scot named William Francis led the Earl of Moray and 30 men up the cliffs of Castle Rock (at left) to overpower the forces of English King Edward II. Edward’s dad, Edward I, also known as the Hammer of the Scots, had successfully invaded the castle before, and so it was his rule that was crumbling as the Earl of Moray’s small war-band took the castle back. James II received one of the most powerful weapons of the late medieval ages—Mons Meg, cannon of cannons—as a wedding present. Let’s just say I’m a wee bit jealous. 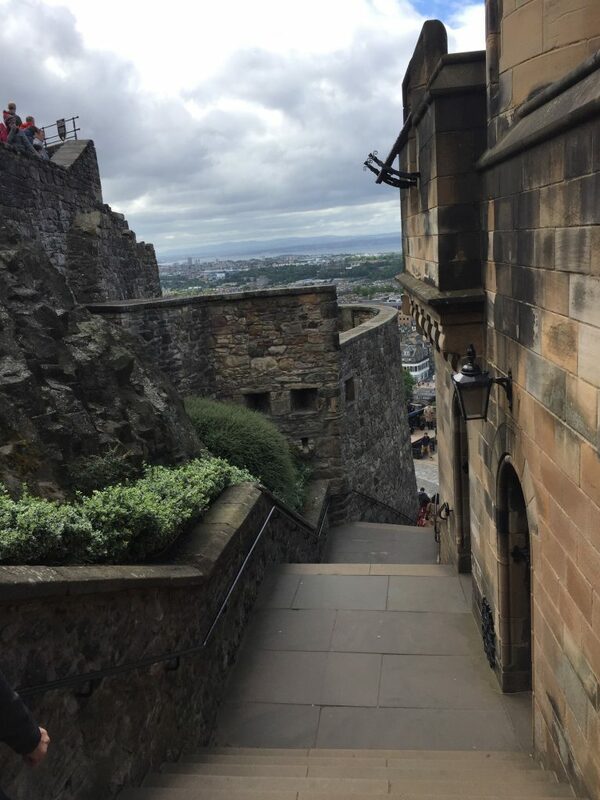 During the English Civil Wars, Edinburgh Castle lost its status as a residence for royals and was turned into barracks for Oliver Cromwell’s garrison, then, later, for the Jacobites’, and, in the 18th century, a prison as well. But a hundred years after that, Sir Walter Scott, with his hugely popular writings and ongoing promotion of Scottish history, inspired new interest in the castle. That new interest eventually translated to renovations, including ones in a “medieval” style that may not be accurate but have done much to define how people imagine the medieval world today. The Lang Stairs by Argyle Tower show the two styles clearly: a 19th century tower on the right (designed as the top of Portcullis Gate by Edinburgh architect Hippolyte Blanc), and part of the old structure to the left. The only original building from the castle’s early days is St. Margaret’s Chapel, a modest structure built in 1130 that now overlooks Mons Meg. This castle today is a popular tourist site, but also a major part of the city. You can see it from the Royal Botanic Gardens miles away, as well as over the rooftops from the terrace level of the National Museum of Scotland, and from many other spots in the Old Town. I admit: I am absolutely in love with this castle. During my last visit to Edinburgh, I visited three times (my Historic Scotland Environment membership made that easy). Edinburgh Castle and I are now old chums. 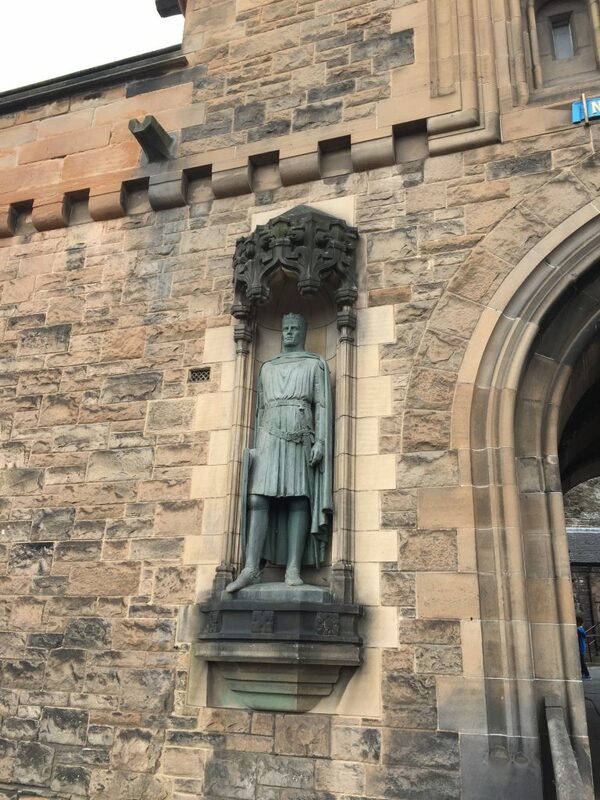 A 20th century statue of Robert the Bruce, Scotland’s great warrior king (from 1306 to 1329), greets visitors from one side of a late 19th century gatehouse. 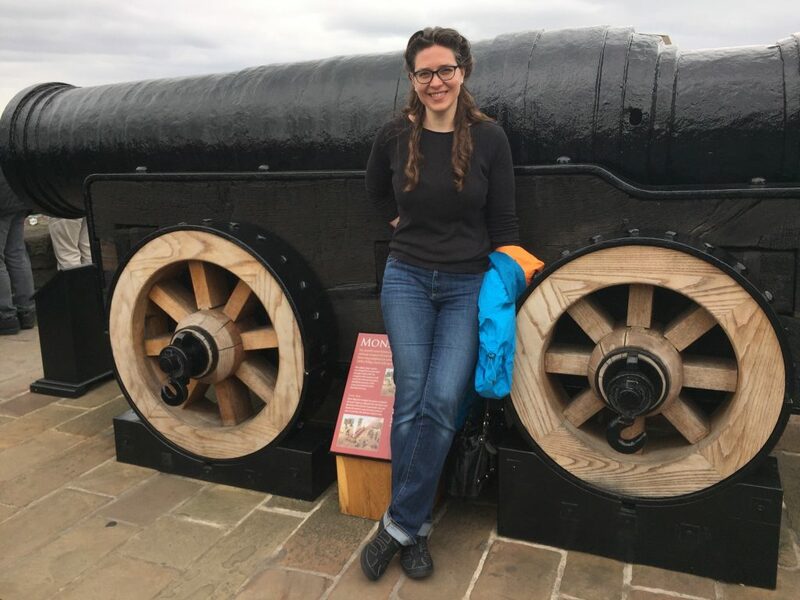 As I was leaving from my final visit to the castle, I wished him goodbye—to the confusion of the tourists around me who didn’t quite know to whom I was speaking. Many thanks to Edinburgh Castle and Historical Environment Scotland, which oversees and protects this and other important historical sites. 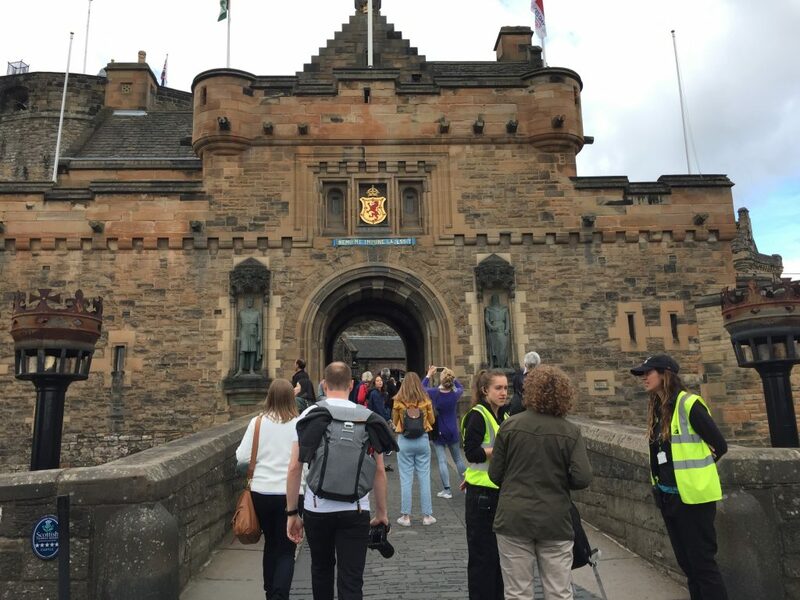 Thanks also to the friendly staff at Edinburgh Castle and for the informative panels and excellent guidebook they put together, which broadened my knowledge and perspective of this, my favorite castle.